A storm system looks to bring an extended period of solid rainfall to the Garden State from late Thursday through Friday. We know what they say about April showers... But how do you feel about May downpours? A bunch of rain and some unseasonably cool temperatures are on the way in the coming days. Thursday is starting off chilly, and even a bit frosty in spots. NW NJ and the Pinelands have dipped into the 30s, with widespread 40s across the rest of the state. As advertised, it's the coolest morning in at least a week and a half. Areas of patchy frost are possible until the sun rises above the horizon. Clouds will slowly increase across the state Thursday morning, followed by thicker clouds filling in Thursday afternoon. The NAM model has been particularly bullish over the past couple of days regarding showers entering New Jersey after 4 p.m Thursday. Not a sure bet, and our Thursday will be mainly dry. Most of our impending rain will hold off until Friday. Meanwhile, high temperatures will climb to the upper 50s along the coast and lower 60s for inland New Jersey on Thursday. Decidedly below normal for early May. Thursday night will bring clouds and the continuing chance for a shower. It won't be nearly as cold as Wednesday night, as lows bottom out in the lower 50s. 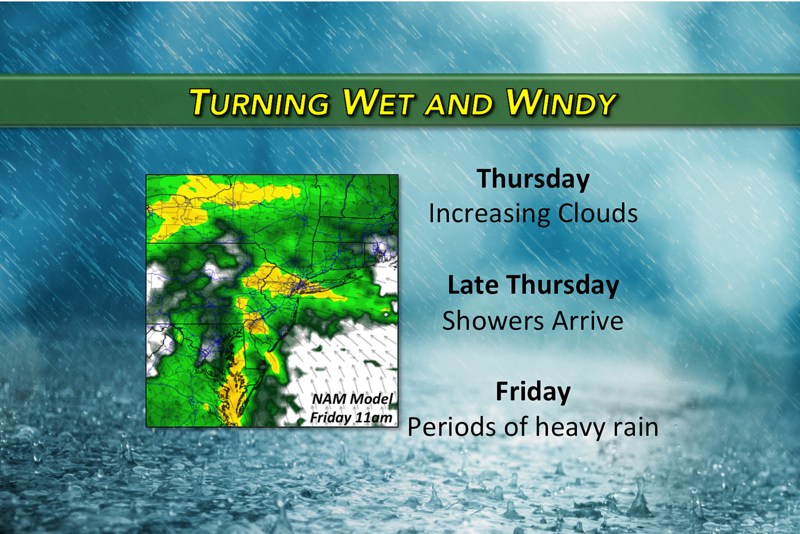 Then along comes Friday, which promises to be a wet and windy day for all of New Jersey. I'd even call it miserable at times, given the outlook for widespread soaking, wind-driven rain. The heaviest rain looks to happen between about 8 a.m. and 6 p.m. Friday. That's not to say it's going to rain non-stop within that timeframe — there could very well be a break in the steady rain and even a peek of sun Friday afternoon. I think we'll see widespread rainfall totals in excess of an inch across the state — that's healthy, to say the least. There could be areas of 2+ inches of rain too. Rumbles of thunder will be possible. Ponding of water on roadways is likely. Flooding of low-lying areas certainly can't be ruled out. Rain will taper off to showers Friday night as this soaker storm system moves off-shore. However, models suggest another brief round of rain will occur Saturday, on the backside of this system. Best timing for those showers would be Saturday afternoon. I think Saturday will also feature a few breaks of sunshine. That will help temperatures bump into the mid 60s — still a bit below normal, but not terrible. Sunday looks drier, but cooler. I wouldn't rule out an isolated shower, with skies otherwise showing partial sunshine. High temperatures will only reach the upper 50s to lower 60s to close out the weekend. Early next week, an influx of even cooler air might keep high temperatures in the 50s for Monday and possibly Tuesday too. Our next sustained warmup? Still over a week away.